A 7 year old boy was admitted by the local team after previously being investigated for short stature and long history of vomiting over the previous couple of years. The height at admission was 104cm. There were no reported subjective visual problems. He was also getting headaches up to 3-4 times a day over the previous few months. His younger sister who was 5 years of age had already overtaken him in terms of height. CT and MRI scans showed a very large cystic tumour with solid and cystic components. The tumour was multiloculated and involved both frontal lobes, which seemed to be evolving from the sellar with a sphenoid component. It was difficult on the pre-op MR to see whether or not the floor of the third ventricle and hypothalamus was truly involved or not. Most of the tumour seemed to be pre-chiasmatic and growing up into frontal lobes. The first treatment was an image-guided endoscopic fenestration. At the time of surgery, it was noted that the cyst wall was exceptionally thick and it was difficult to introduce the endoscope. Nevertheless, a washout of the cysts and decompression were performed. As the cyst walls were so thick, it was difficult to communicate all of the cysts completely. Postoperative CT scans showed good decompression of the cysts, which certainly relived some of the pressure. He then went on to have a planned craniotomy and resection 6 weeks later, with a pre-operative goal of aggressive debulk of the tumour. In terms of grading its risk, there was a risk of hypothalamic damage by resection. The high risk factors are that it was greater than 4cms in size and there was early obstructive hydrocephalus. The positive factors were that it was probably pre-chiasmatic. There was no hypothalamic syndrome pre-op in terms of morbid obesity and the floor of the third ventricle did not look completely destroyed. A decision was made therefore to do an open craniotomy and resect as much as possible with a view to assessing the risk of hypothalamic involvement at the time of surgery. A left sub frontal retraction was used to expose the tumour. Multiple cysts were entered and decompressed, with a left sub frontal approach, and we were able to go across to the opposite side and gather in the tumour from the contralateral side having exposed both carotid arteries and optic nerves. The tumour was systematically de-bulked and removed with a combination of ultrasonic aspiration and micro-dissection. Both internal carotid and the basilar artery were identified and protected. At the end of the procedure, the optic nerves looked intact and healthy, although they had been compressed by the tumour. The tumour seemed to be rising out of the sella. The tumour was resected from within the sellar and separated from the dura. The tumour was anterior to the anterior cerebral arteries, A1 and arterial communicators and it was in front of the chiasm and therefore the lamina terminalis was not breeched. Hopefully the actual third ventricle floor and the hypothalamus were spared. Most of the tumour was described as in front of or above going into and involving both frontal lobes. Once we removed the tumour from the pituitary fossa, it was noted that the pituitary body was preserved but the stalk which was blended in with the capsule of the tumour was sacrificed. There was a small amount of capsule adherent to the cavernous sinus on one side which was left, so the sphenoid could not be entered from above. Therefore the pre-operative sphenoid component which seemed to show some involvement was not reachable from above. Intra/postoperative MRI showed near total resection of the tumour. There was some on-going signal in the sphenoid cystic component as expected. We will therefore classify this as a near total resection and we planned to keep an eye on the sphenoid components in the future. Postoperatively, the child did not show new neurological deficits. His vision was also unchanged. He continued on vasopressin, thyroxin and hydrocortisone. The pathology has been confirmed as a craniopharyngioma, and we planned to continue a radiological monitoring only with interval MRI scanning and not offer upfront radiotherapy. This was partly because he was still relatively young and there was no definitive solid component left of the tumour to target, but rather collapsed areas of cystic components in the frontal lobes and an abnormality in his sphenoid, which was undetermined. Following his initial surgery the residual sphenoidal component was monitored, but a MRI scan in September showed progression of the sphenoidal component and therefore this was excised by an endoscopic transphenoidal approach. A post operative MRI scan on the 30th September showed complete resection of the craniopharyngioma. A planned MRI scan undertaken 3 months after surgery showed recurrence of the tumour both in the sphenoid region and supratentorialy in the left frontal lobe. 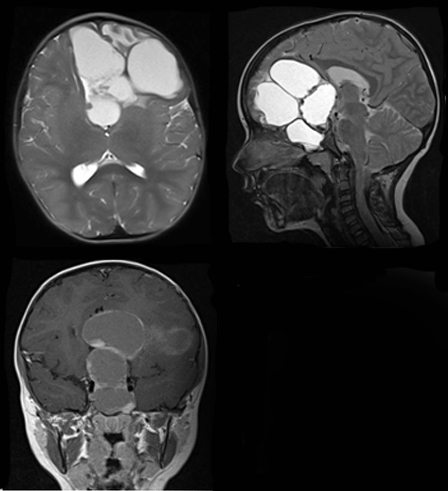 Whilst recurrence of craniopharyngioma is not uncommon requiring further intervention, we considered the rapid and progressive recurrence of this tumour unusual. We then performed an endoscopic transphenoidal approach achieving macroscopic complete resection confirmed by intra-operative MRI. Considering the aggressiveness of the tumour we then decided for proton beam therapy followed by radiological monitoring. An MRI performed two years after the completion of radiotherapy unfortunately showed the tumour was once again progressing with increase in the cystic change in the region of the sphenoid sinus/adjacent sellar. We considered the various treatment options and wish to proceed with the insertion of an ommaya reservoir to enable tumour/cyst decompression and treatment with intracystic Interferon. We have just started the first cycle. Is two steps-surgery (urgent cyst decompression and then elective resection) the advocated strategy to appropriately assess hypothalamic involvement and relative extent of surgery? Would you have advised upfront radiotherapy after resection? Would you have attempted a second transphenoidal resection instead of intracystic treatment? Would you have advised intracystic treatment at presentation? Craniopharyngioma management always raises a question as to how much to do and what should be an acceptable outcome in each individual case. Although there are a number of modalities available to supplement surgery, there is no uniformity in utilising these since there is lack of standardised protocols due to paucity of data on long-term outcomes of single or combination modalities. For these reasons, SIOP-Europe Brain Tumour Group endorsed an online survey. 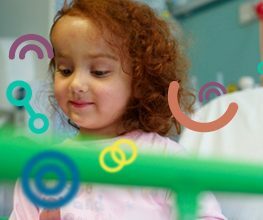 The primary objective of the survey is to gather information from different units on the management of paediatric craniopharyngioma, focusing on the surgical attitudes and approaches, particularly the intention of surgeon at the first surgery, the timing of radiotherapy in patients with residual tumour and the use / availability of additional non-surgical modalities. The electronic survey link is enclosed below and should take only 10 minutes to complete if you wish to take part of it. This case of the month was prepared by Benedetta Pettorini and the team in Liverpool. We welcome responses from our esteemed colleagues out there. Please send your comments to me and with a bit of editorial pruning reserved, we could see your comments posted on this page. Remember also, if you have a case that you think would be interesting for your colleagues to see or stimulating for discussion, send me an email and let’s discuss the possibility of getting it up on this page.